The alphabetic script unites a number of civilizations in ancient Syria-Palestine, which together constitute the background of the Hebrew Bible and the New Testament. This work presents overviews of the relevant languages and their interaction. The authors focus on the evolution of language in the digital era. They explore the aspects of humanities and linguistics in the digital environment. The book focuses on language and translation and includes topics on the digital translation policy. This handbook introduces key elements of the philological research area called paremiology (the study of proverbs). The basic notions, among others, include defining proverbs, main proverb features, origin, collecting and categorization of proverbs. In this volume noted scholars discuss the history of philology from antiquity to the present. This book addresses a wide variety of authors, documents, and movements, among them Greek papyri, Latin textual traditions, the Renaissance, etc. This book discusses current developments in semantics and its relationships to theoretical linguistics, to applied linguistics, and to other related disciplines. It includes the fields of anthropology, computer science, philosophy, and psychology. The Atlas of North American English provides the overall view of the pronunciation and vowel systems of the dialects of the U.S. and Canada. The Atlas re-defines the dialects of American English on the basis of sound changes active in the 1990s. Written to help readers become independent language analysts capable of critically evaluating claims about the language. It guides its readers on topics including basic assumptions about language and discourse, pronunciation, parts of speech, etc. A course in phonetics for students of French, German and Spanish. It focuses on the structure and function of the vocal tract, the classification of vowels and consonants, the International Phonetic Alphabet and its use in phonetic transcription. In this volume, a selection of leading experts in various key areas of corpus construction offer advice in a readable and largely non-technical style to help the reader to ensure that their corpus is well designed and fit for the intended purpose. Practical and invaluable guide to clear and precise diction for writers, speakers, students, business and professional men. With notes on the correct use of prepositions; designed as a companion for the study and as a textbook for the use of schools. This monograph was written to make it easier for those curious about AUG to understand this interesting linguistic theory. 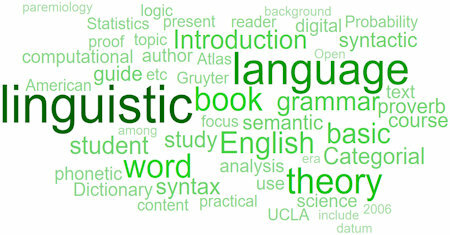 Topics: A description of the semiotic theory of language; Phonology; Genotype Grammar; Phenotype Grammar; and Methodology. This book is intended for university-level students of English who have already taken a practical grammar course. Our aim is to provide the students with a brief survey of English morphological problems in the light of present-day linguistics. What kind of computational device could use a system like a human language? This text explores the computational properties of devices that could compute morphological and syntactic analyses, and recognize semantic relations among sentences. This textbook grew out of our efforts to develop teaching material for the undergraduate-level Introduction to Syntax course. It is particularly well suited to general readers or those who work in disciplines related to linguistics. Contents: Morphology; Syntactic analysis; Clauses; Many other phrases; X-bar theory and discontinuities; The model of syntax; Binding and the hierarchical nature of phrase structure; Apparent violations of Locality of Selection; Raising and Control. What are human languages, such that they can be acquired and used as they are? This text surveys some of the most important and recent approaches to this question, breaking the problem up along traditional lines. The emphasis is on methods. You don't need to be a philologist or an etymologist to become engrossed in this book on the vulgar tongue, popular language and not crude or coarse talk. It contains the fashionable words and favorite expressions of those olden days. Contents: Basic Categorial Syntax; Shortcomings of Standard Categorial Syntax; Expanded Categorial Syntax; Examples of Expanded Categorial Syntax; Categorial Logic; Basic Categorial Semantics; Lambda-Abstraction; Expanded Categorial Semantics; etc. These are the always evolving notes from an introductory course on syntactic theory taught at the University of Massachusetts at Amherst. Its target audience is first-year graduate students, but no background exposure to syntax is presupposed. The author offers a stylistically and conceptually exciting investigation of the nature of language, mind, and personhood and the many ways the three connect. Bencivenga contests the basic assumptions of analytic approaches to these topics. The book should attract the attention, not only of the scholar, but of the philosopher, the historian, and the theologian, to a science which concerns them all, and which teaches us that there is more in words than is dreamt of in our philosophy. This set of structural methods for descriptive linguistics is intended both for students of linguistics and for persons who may be interested in linguistics. The techniques are given here in some detail, without employing the terminology of logic. The Dictionary presents more than 750 words that have unofficially joined the English language. These words are hot off the street, new even to cyberspace. Each entry features a definition, etymology, and at least three citations from print. Word study and English grammar are important for several reasons. A man's use of words is commonly taken as a measure of his knowledge and even of his intelligence. Carelessness often causes a man to be held in much less esteem than he deserves. The book discusses words and word meaning, phonological categories, phonological processes, the ways in which the units of word form interact with one another, compositionality, the productivity and flexibility of language, etc. Author takes examples of bad writing and rips them to shreds. These mistakes are revelations about the mind that wrote them. The examples of bad writing that come from educators are given special attention. Mitchell's first book is also his best. Five essays investigating both the economics of language and the language of economics. The author touches on the structure of binary relations in daily language, the evolutionary development of the meaning of words, and more. The book focuses on the basic set of ideas and facts from the fundamental science necessary for the creation of intelligent language processing tools, without going deeply into the details of specific algorithms or toy systems.